KONG Jumbler Disc is a fun and challenging 2-in-1 toy. Inside the Jumbler is a tennis ball with squeaker, which guarantees fun. Thanks to the useful handles, the Jumbler Disc is easy to pick up. This also makes this toy suitable for fun tugging and retrieving games. KONG The Jumbler Disc is a 2-in-1 toy that guarantees a lot of fun. Inside the Jumbler is a tennis ball that will motivate your dog to play. The Jumbler is easy to pick up, so it is also suitable for fun tugging and fetching games. The squeaker in this toy makes it even moren fun! KONG has many more fun toys for your dog. View the entire KONG range here. Pink, green or blue/orange This product is delivered in an assortment, making it impossible to choose a colour. 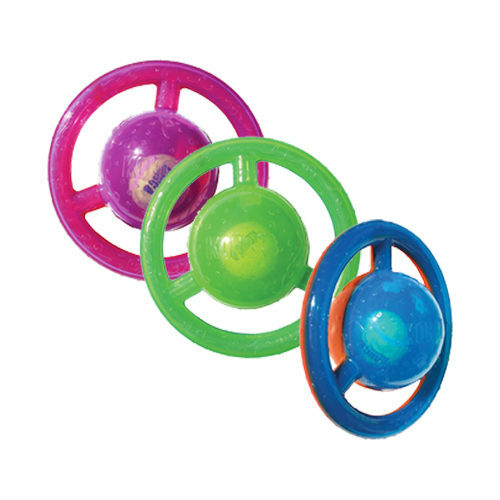 Have you used KONG Jumbler Disc before? Let us know what you think about this product.